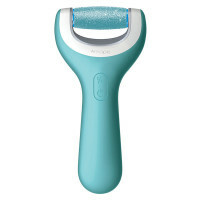 With Amopé Pedi perfect™ Wet & Dry it is no effort to keep your feet silky smooth. Take your time to experience a new foot care routine and you will notice immediate, convincing results. Soft, beautiful feet go nicely with shiny nails! Now you can easily file, buff & shine your fingernails and toenails with the Amopé Pedi perfect™ Electronic Nail Care System. Well-fitting shoes are important not only for your comfort, but also to avoid hard skin. Inappropriate shoes may cause pressure on certain areas of your feet, which leads to hard skin. The wrong walk leads to an imbalance in weight distribution, which in turn leads to an imbalance in pressure. Some parts of your feet are then more likely to produce hard skin. Dry feet are very likely to get hard skin. The absence of oil glands on the bottom of your feet causes the skin to dry out faster than in other regions of the body. This leads to painful cracks and hard skin. Therefore you should put lotion on your feet and prevent them from drying out. We recommend our Amopé moisturizing range for dry feet. Whatever you’re up to – smooth feet, shiny nails or dry feet – Amopé has a solution for the unique needs you and your feet may have.